Today’s texts between me and Pat, during my lunch hour (and JUST getting to work). 8:00 Code word: pickles! Love! 12:18 Lickle the pickle and tickle my boy! 12:24 The waffle is a pretty beige plaid pattern. Also. Blueberry. That is all! GOOD DAY SIR! 12:36 I SAID GOOD DAY! 12:39 The colors man. THE COLORS! I can taste the rainbow of awesome and it is loud! 12:43 I would like to state for my defense: I have only had 24oz of caffeinated beverage in the form of canned Mt Dew. This is all (insert bank name here) kool-aid. Really, the whole teller line is bouncing around our confines. 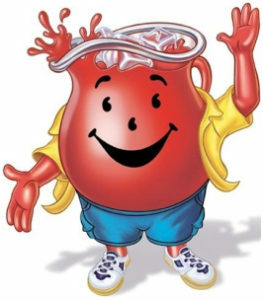 Don’t drink the kool-aid! Or do. Up to you! 12:49 We have been found out! New code word: bird! Bird is the word! Caw twice and I’ll know it’s you! 1:01 Huh. An entire box containing 1000 packets of sugar, and coffee stir straws. You thinkin’ what I’m thinkin’? 1:03 Oddly, not what I was thinking! I think his long gaps of silence was him trying to not encourage me. Which backfired since I then decided to make each new text more fun than the last to try and get a reaction. Also, really, there was no shutting me up.